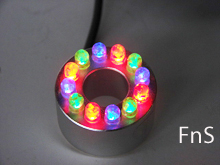 12 LED colored lights that change automatically! Ring Light has 12 LED colored lights; 4-Red, 4-Blue & 4-Green changing lights. Lights change from red to blue to green and then all at once. The color change is subtle, not flashing. Two pin connection as shown in the "More Images" above.